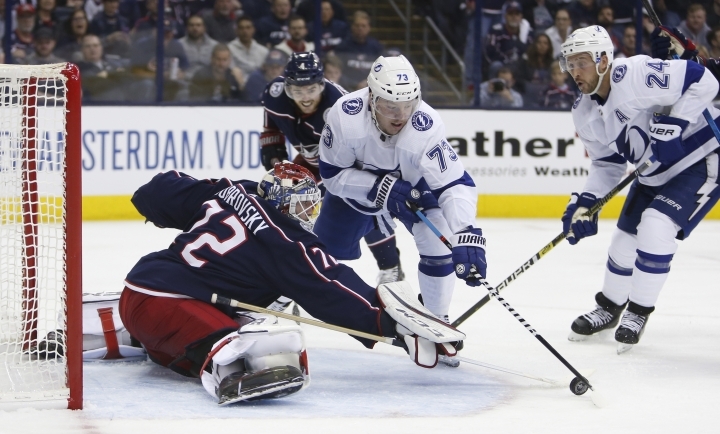 COLUMBUS, Ohio — The Columbus Blue Jackets extended their postseason mastery of the Tampa Bay Lightning, beating the NHL's best team 3-1 on Sunday night and moving to within a game of sweeping the playoff series. LAS VEGAS — Mark Stone had three goals and two assists, and Vegas beat San Jose to take a 2-1 lead in its first-round playoff series. ST. LOUIS — Kyle Connor scored twice, Patrik Laine had a goal and an assist, and Winnipeg beat St. Louis to climb back into its playoff series. PITTSBURGH — Jordan Eberle scored for the third straight game, Robin Lehner stopped 25 shots and New York stunned Pittsburgh to take a 3-0 lead in its best-of-seven, first-round playoffs series.